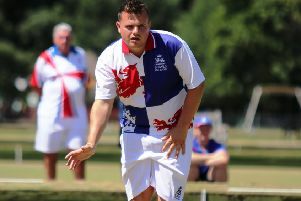 Northants Men were beaten 141-121 in their friendly against Norfolk at County Arts IBC in Norwich. The defeat brought an end to the County’s 100 per cent start to the season. Northants shared winning rinks, but one losing rink did so by a large margin, which flattered the home county’s final advantage. The highest winning rink for the County was that skipped by Norman Gibb, which took the victory by 21 shots. The County enjoyed four winning rinks, with two losing, and they won easily. The highest scoring of the County’s rinks was that skipped by Linda Warren, which posted a 20 shots win. THE following players have been selected to represent Northants Ladies in a friendly against Wellingborough BC next Monday (Dec 11, 2pm). IN the Wessex League, Kingsthorpe enjoyed a 103-59 win over Daventry. The Wessex is a men’s league, with four rinks per club, two playing away and two at home. Kingsthorpe claimed 14 points and Daventry four from their 103-59 win. IN the County League, Northampton & District suffered a 69-62 defeat to Kettering Lodge. The County League is an inter club county competition for four triples of men, with two playing at home and two playing away. Kettering claimed four points and Northampton two. Daventry were beaten 94-48 in their match with Desborough, meaning they get zero points to Borough’s six. LATEST results from national competitions. Desborough IBC ‘B’ beat Northampton & District IBA ‘B’ 49-28. Daventry IBC beat Desborough IBC ‘A’ 43-18. Men’s Over-50ws Triples: An inter club competition for a single triple of players over 50 years.